Several months ago, the co-owners of Fancy, an all women’s advertising agency, joined my Speak with Impact Lab because they wanted to promote their survey of women over 40 and get comfortable speaking about their mission to change how women are portrayed in advertisting. They found the idea of public speaking deeply uncomfortable– standing up and giving a speech felt like talking at people and they wanted it to feel more like a conversation. Since they worked in advertising, they were already great storytellers, and we built on this strength and worked on strategies to involve the audience and make their presentation more playful. They wove in personal stories and a healthy dose of humor to make the work relatable and bring their agency story to life. 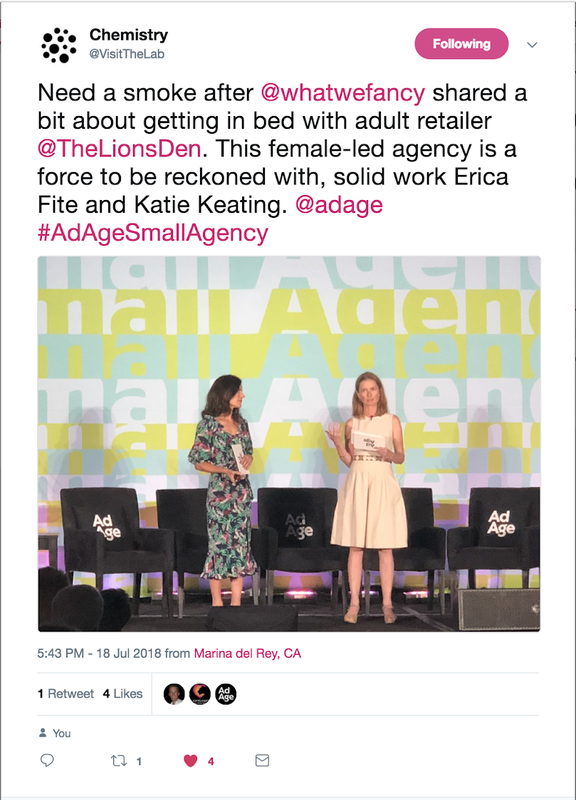 Just after the course, they were invited to speak at the Small Agency Conference in LA and they used my step by step process to write their talk, practice with purpose, and walk in feeling prepared and excited to share the story of how they hooked up with Lion’s Den Adult. They gave the hit talk at the conference in front of 350 people and I couldn’t be happier to support them in their quest to elevate what matters to women. Since my course, they've also spoken on panels and been interviewed on television. Check out their work and follow what Fancy is up to here. Read another client success story here.